Discussion in 'Gear Reviews/Test' started by Ratdog68, Dec 14, 2015. 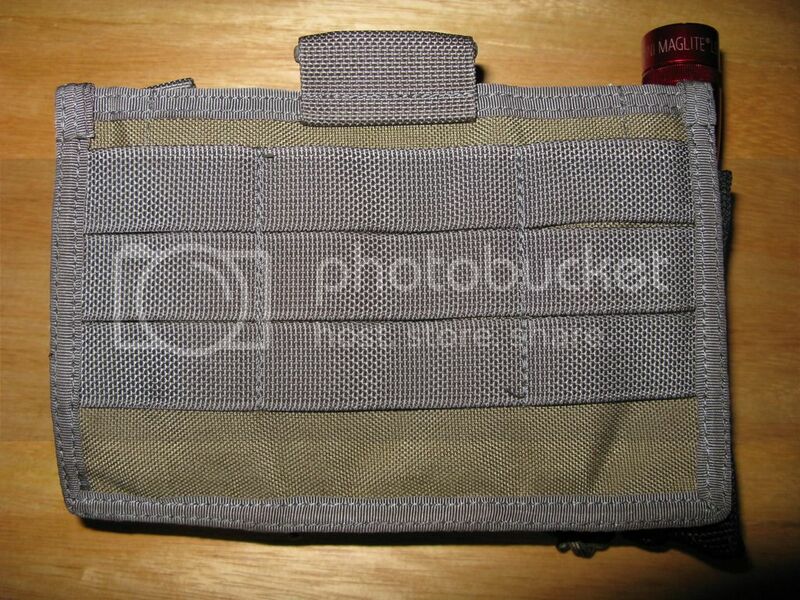 The tab at the top is a pull, a flat velcro secured pocket is between the front/back. 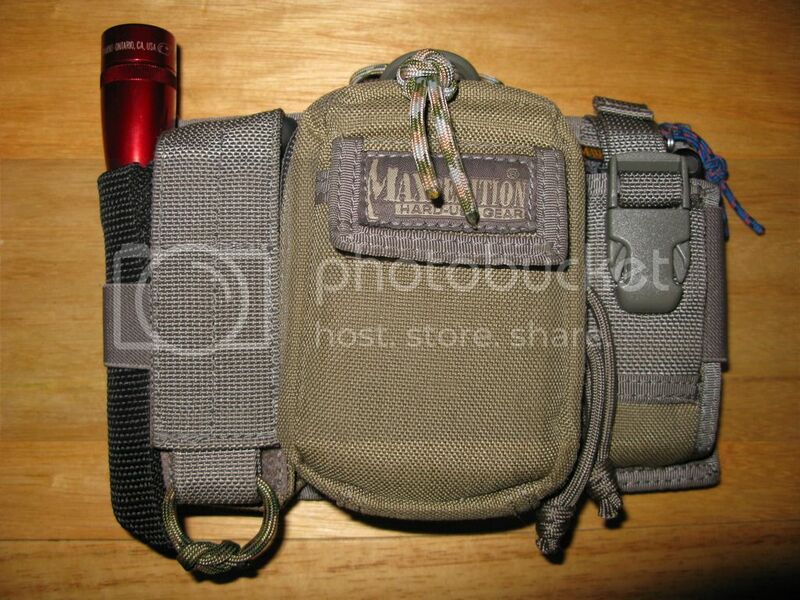 Molle web on the back. Cut yourself three strips of leather. Two of them get a belt clip attached, as well as snap hardware (female/button side). Those two are just wide enough to slip in a column of webbing and hang below. The third piece is wide enough to span the width of the pouch, just tall enough to go from the bottom edge of the bottom webbing to the bottom edge of the pouch. 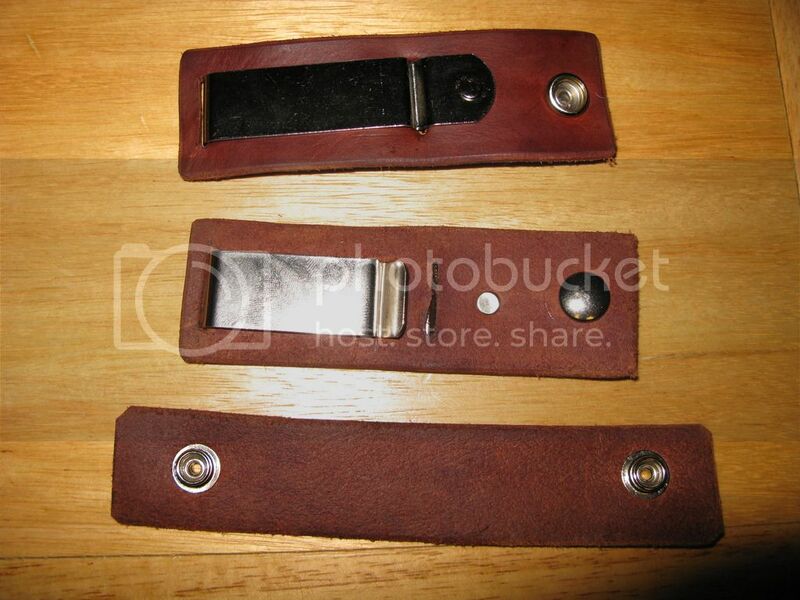 This third piece of leather gets two halves of snap hardware (both male/post), one on each end. The pic shows each face of the clip hardware, it's slipped through slots cut in the leather, and then riveted to the leather. Slide the two pieces (with clip hardware) down through webbing columns... one on each end, and snap the three pieces together. The third piece acts as your anchor, keeping the two vertical pieces from sliding up/out as the pouch is worn. Attach to your trouser belt to use it. 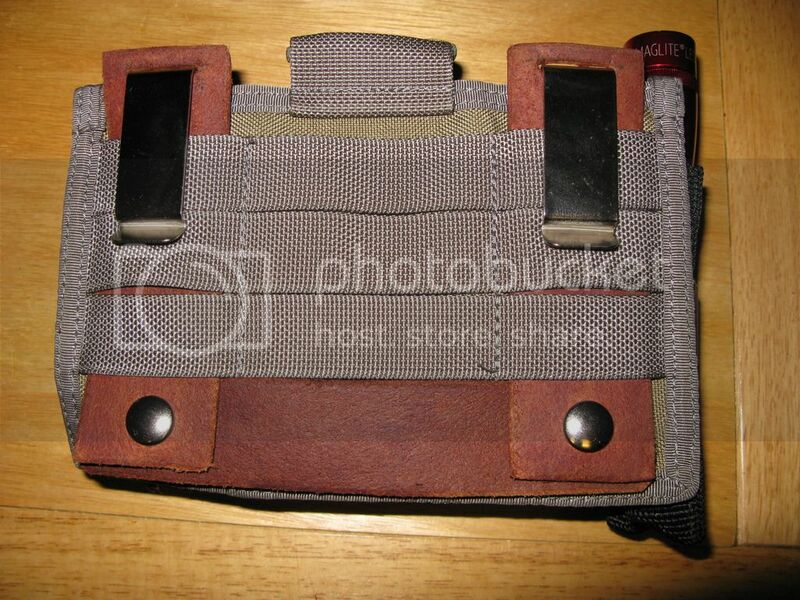 Unsnap and remove the leather when you want to Molle your pouch to a pack. Chopperdrvr, Brian Shaffer, FrankT and 1 other person like this. Daayyumm RD! Really like the leather craft work you keep bringing here. Maybe you need to talk with Justin C. at Tactical Taylor...bet he would put you to work, or buy some of your ideas.. Thanks... Tactical Tailor has a nice shop/store. Visited them a couple of times. Long drive though (time wise, more than distance), at least 4 heavy bottle necks of traffic to get there.